Let’s start with the more common house pet. The practice, when successfully used, can help with anxious dogs cope with separation and hyper dogs that jump up on people for attention (or claim you as theirs). The reason this works in assisting the dog to be calm and polite is that a dog gets to know us by smell before sight. If you don’t look at your dog it should back off, even if slightly, and wait for an invitation for attention. If there is no invitation they should just give you back your space. Now, this being said, in the past I have been a HORRIBLE offender and have had a practice of wanting to pet and cuddle every dog I have ever seen the moment I see them. (Editor’s Note: The whole family is like this. The kids are very good about asking an owner before petting their pet. I, however, have been known to pet stray animals and once got ringworm from a stray cat! Oops!!!) I am wrong for acting this way and I will be better in the future. I see this on a daily basis and need to correct it in myself and work with the family on this as well. The example I have in mind is when Lauri gets home from work and gets greeted at the door as quickly as possible by the kids (they will slide across the tile and almost knock me over!) and Casper (he acts like Dan gives him no attention all day and we KNOW that is not true). If I don’t happen to be there to hold his harness he does his “happy puppy dance” and gives her no space what so ever (I have even punched him in the snout on accident just trying to get out of my coat). Granted, all of us are happy to see her and we all want to greet, and be greeted, but this is an inappropriate behavior. A better way to act, on all of our parts, is to calmly greet from a respectable distance and allow whoever is entering to feel respected and peaceful. I understand that this is going to likely take longer for the children to grasp than Casper. Let me now extend this to Casper while he is “officially” working. 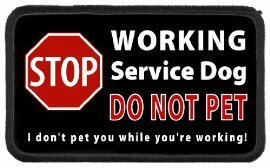 (I will use this term because he is a service dog but I don’t require him to “work” when we are in the house.) Let me also be clear, though, that from my experience he is never off duty. Even when he has been in full play mode with no collar, harness or butterfly vest on him he always has an eye on me and if I fall he is there in a moment’s notice to help. I have plenty of real life examples, but I will let you read the blog at your own pace and see for yourselves. I am, admittedly, the learn-by-doing type. 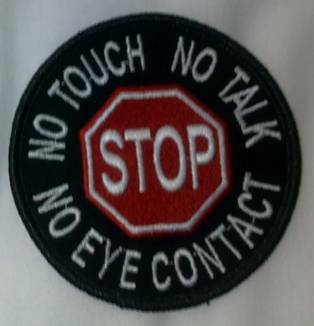 This means that the wonderful people at SDP who raised and trained Casper could have told me a million times that I need to implement the “NO: Touch, Talk, Eye Contact” rule every time you are in public and I would not have listened until I experienced why I need to do it. I have difficulty with this because I know how a guy like Casper can attract attention and I don’t see that as a bad thing all the time. 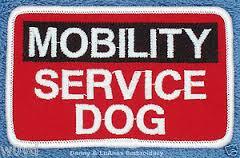 I want to be approachable and teach people about service dogs and disability acceptance. I have carried a misconception that these two things are mutually exclusive. What this means is that I have set a precedent of allowing people in to our space to greet in almost any situation and I now look back on this and realize it was a mistake. I see this clearly with the people Casper has made friends with at the office. There are a select few people whose very presence cause him to break his down-stay and seek attention. He will even look for them as we pass a particular area. This is my fault. I taught him to be distracted. I did not purposely do this; I was misguidedly trying to be nice to everyone. I think it is my failed attempt at acceptance, and I honestly don’t know if it was for him or me; I suspect, though, it was selfish. I can see in situations where I do not let Casper be social, even if I want to, that he is perfectly focused and happy all at the same time. We feel that it is important to update you all on the resolution of Casper’s “incident”. We will make it brief because we want to move on from this. I (Lauri) would also like to explore another topic that this brought up for me. I hope you all will indulge me in this. It does not pertain to Casper or disabilities, but I think it is something we should find important. This week we have reached some resolution to the interaction between Casper and the child who made the false accusation against him. Finding this resolution was multi-tiered. The first step was a meeting between us, representatives from the board of directors and the minister. The meeting went well, concerns were voiced and everyone was heard respectfully. We were able to learn that existing policies regarding the behavior of children and their proximity to their parent/guardians will be enforced. We agreed that the Casper meet and greet process needed to be modified. In the past we allowed socialization at any time while attending church. In the future we are asking that the sanctuary and common halls be working areas, while the community room would be a good place for everyone to have the opportunity to show Casper some love. The second tier to this resolution came in the form of request to speak at a town hall style meeting so that I could share a few key points regarding expected behaviors around a service animal in an effort to educate. Of course, we took the opportunity. The talk and follow-up questions went quite well. We view this as an opportunity to begin a new chapter in educating people about service dogs. It has been our feeling that eventually we will become speakers on the subject in some capacity and this was our first chance to give it a try. Moving on I (again, Lauri) would like to make it very very clear that we hold no grudge or resentment toward the boy who told this fib. We truly believe that was all it was, a fib. He was caught doing something he knew was wrong so he tried to distract from that with a tall tale. That is absolutely normal for young kids. As I have said before, we all did that as children. What bothers us, and what we are having a really hard time with still, is the life given to this lie and that is what I want to write about. For me lying is the incredibly hurtful. I did more than my share of it as a kid/teenager but as I grew up I realized how much it hurt me to be lied to and decided I did not want to make someone else feel that way. At first I learned to just omit the truth rather than lie. Then after I got even older I made a very strong effort to not even do that. There have been times I slipped and kept this or that to myself, but I like to set an example for my own kids so I do my best not to lie or omit truths. Let me tell you here that so far this example I have set has not taken root. Our kids are liars. They are VERY bad about it. We are currently dealing with this issue. They both have been hiding homework and playing us against their dad and step-mom because they knew they could. They could do this because we made a BIG mistake. Their father and I do not like to speak to each other unless under dire circumstances, therefore the kids have used this to their benefit. By not comparing notes they can tell us different stories and no one is the wiser. Our mistake gave life to their lies and gave them power. This is exactly what happened with the Casper incident. The lie was given life by the adults who believed it and took it to a higher level. I am happy to say that both households are now on the same page and we are communicating on every single thing the kid say. Their teacher’s are on board now too and emailing us when assignments are not received. They are in a homework lock-down and grounded until… possibly forever, if things do not get better. The kids have had a very rude awakening because we have chosen to take all the power away from their lies. Sadly, we do not feel that this other family has done anything to lessen the power of their boy’s lie. Despite the meetings we have had we still feel very hurt by the way things were handled. Dan and I both have a lot of work to do in terms of forgiveness and we are doing our best. For now, however, that lie still has the power to make us feel resentment and discomfort. We are working on our own to take that power away and move forward, but at this time we have made a decision to no longer attend regular church services.